Bring back the Color to New York City. It’s been a tough week for the Big Apple this week with the arrival of Hurricane Sandy. Flooding, power outages, transportation closures and business shut-downs have certainly put a damper on things. 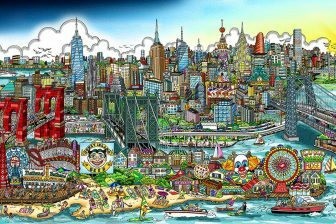 So, we thought we’d launch our new Color Your Own Fazzino page to give you the chance to bring the color back to NYC. 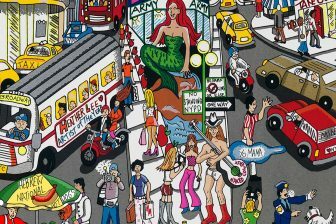 Fazzino art lovers and aspiring artists of all ages will be able to stretch their coloring muscles on an ongoing basis with some of the artist’s most beloved pop art images. 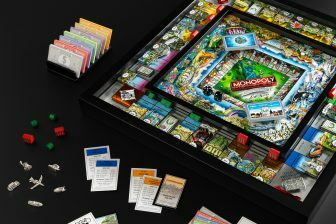 The interface is easy and fun. Send us your finished masterpiece and we may feature it on the Fazzino art blog. We’ll change the image on the free coloring page as the seasons change, so check back for new projects to create and color. Charles Fazzino is often asked about coloring books by collectors who think his images would be perfect for this type of kids project book. He did, in fact, create one coloring book of images for kids in the 1980’s. 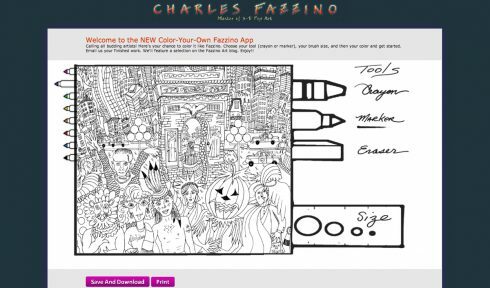 With this new coloring app, we’ve brought the idea of a Fazzino online coloring book to the world of the Internet. Fazzino joins the likes of other famous artists and Masters whose works have been featured as coloring projects. Our favorite for adults is the Color Your Own Picasso page. And for kids, take a look at Coloring4All. Enjoy!